The Downtown Water Waterfront Master Plan in it's current from can best be described as the camel's nose under the tent, the crack in the ice, the toe in the water; pick your metaphor. Had the emphasis on "development areas" been omitted, or at least toned down significantly, it would have been a masterful Master Plan. In the current form, the DWMP sets its self up as the lever to begin the systematic commercialization of waterfront. Required by Charter Amendment, using a process required of and approved by City Council including well-documented public input, the DWMP is exceptional in form, context and content. The DWMP treats the more esoteric issues of the waterfront with great care, carefully documenting the massive public input effort into these sections of the Plan. The commercialization portion of the plan or the "development areas" as the Plan refers to them, seems to be carefully woven into the fabric of the Plan with little public input to support them. The DWMP deftly bows to the City Charter in the Legal Context Section, but does it really? In January 2011, the city’s Charter Review Commission (“CRC”) convened with the purpose of proposing amendments to the City Charter, to be voted on by the city’s electorate in a referendum in November of that year. Among several proposed amendments that came out of the CRC’s deliberation was a proposed amendment for the development of the Downtown Waterfront Master Plan (“DWMP”). On November 8, 2011, St. Petersburg voters approved an amendment to the City Charter creating Section 1.02(g) and requiring the City Council to approve a DWMP on or before July 1, 2015. The charter amendment also compelled the City Council to adopt an ordinance setting forth the procedures for the adoption of the DWMP. The amendment required the City Council, prior to July 1, 2012, to adopt by ordinance, a process to create an inclusive master plan for the Downtown Waterfront, the criteria to be addressed, the manner of adoption and a process to assure that adequate inclusive public input is obtained prior to adoption and a requirement for review and update. The ordinance was adopted by City Council in June 2012, and created a new section of the City Code, Section 16.08, which governs the DWMP’s seven-year review and update procedures. The DWMP shall be amended by ordinance, with notice given to the public and at least one public hearing before City Council. Note in the final sentence above, the DWMP shall be amended by ordinance. This makes the DWMP very easy to modify. A development centric or cash hungry City Council could have a field day. The DWMP is a conceptual planning document intended to provide guidance to the city and its people in their stewardship of St. Petersburg’s singular Downtown Waterfront environment, parks and amenities. The DWMP is subordinate to federal and state law, the City Charter, the City of St. Petersburg Comprehensive Plan, and the City Code of Ordinances. Therefore, specific recommendations contained within the DWMP may require a vote of the city electorate in a referendum, or other acts of city government and public input, before implementation of plan recommendations may occur. The Charter embodies the long-held core values of St. Petersburg’s citizens and, in particular, their shared desire to protect City- owned park and waterfront property. The Charter further outlines the City-wide referendum procedure required of any permanent disposition of public park or waterfront property, including the sale or lease of such property to private interests. 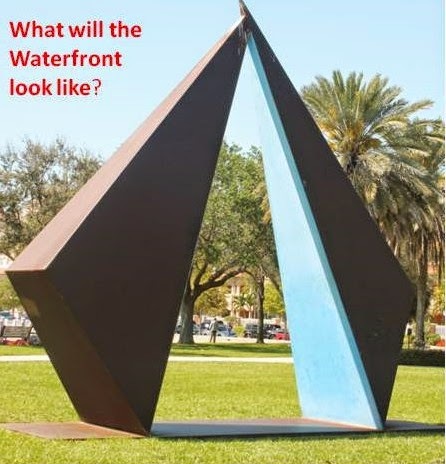 Through this referendum provision, the public’s role in a debate on the future of its waterfront park property is fundamental and will be preserved in perpetuity. Note the reference here: "Therefore, specific recommendations contained within the DWMP may require a vote of the city electorate in a referendum, or other acts of city government and public input, before implementation of plan recommendations may occur." The key word here is may, not shall. The city shall perform a consistency review of certain projects in the context of the DWMP, including but not limited to, capital improvements and programming proposed for the Downtown Waterfront area. The DWMP shall be interpreted broadly to accomplish its purpose and intent. The DWMP shall be read in its entirety, with no single facet to be construed in isolation of the remainder of the document. After development of the DWMP and other documents that may from time to time be created to implement this plan, the administration and enforcement of the DWMP shall be performed by the city in its sole discretion. The provisions of the DWMP shall be effective upon adoption by the St. Petersburg City Council. Note that the Plan indicates that once it is adopted it shall be "interpreted broadly to accomplish its purpose and intent." One of the primary purposes seems to be commercial development of the downtown waterfront and the intent is pretty clear. The question becomes in a scenario where a property on the waterfront designated as a "development area" has been singled out by a developer for say a hotel or a condo, the developer offers to pay market value for the property, the basic design is complementary to the waterfront and meets the requirements of DWMP. The City decides to take the question to a referendum and the developer sues claiming no referendum is needed. The Charter requires a vote on the sale of waterfront property, but the Charter mandated DWMP says implementation of Plan projects MAY require a vote. As a very good lawyer friend of mine said to me on a number of occasions: "On any given day you never know what judge or a jury may do." Therein is the problem. One successful legal challenge based on the DWMP could start a land rush on the waterfront. Some careful tweaking along with a moderation of the "development areas" should eliminate these concerns and put the DWMP in it's proper perspective to the City Charter.